I’m finally starting to get things in gear for the new school year! I’m officially finished with my old job, and a have a bit of a break otherwise (minus a bajillion showers and appointments for me and the pup!) so I’m trying to get myself organized before things really start going. I have a two week training at the end of the month and so I have a LARGE to-do list for myself between now and then. We’ll see how much I get accomplished! One area I’ve been already planning for my new third grade room (eek!) is my literacy block. We are getting Journeys and I’m not very familiar with it. Plus, I’m not all about basals in the first place. So, I’m already brainstorming how it’s all going to work in my room. I’m thinking I may do a modified Daily 5 (does anyone not modify it?). I like the way they do a gradual release and they hit the major components I’d want to it. I just have to work out the scheduling of it all because I know there are some whole group things I’m still going to need to have time to do. And I’ve also been brainstorming a few things I can incorporate into the blocks that are a bit more mandated and allow the students to work on targeted skills a bit more. One big area I want students to work on during our Daily 5 time will be fluency. I haven’t decided which block it’s going to go into (but I’m thinking maybe Listen to Reading because I don’t have a lot of resources for the books to be read aloud at this point and will need some items to help stretch it.) So I’ve put together a couple resources to help me. I made these ppts about 5 years ago when I was doing remedial reading. I used them mainly with my 3-5 grade students. As I was working with a group of students, another group was doing an independent reading or response task. 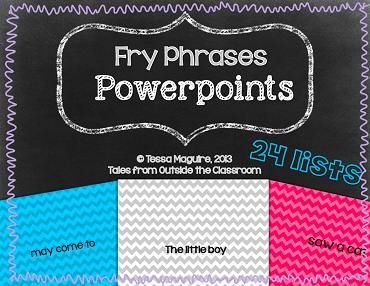 If they finished before I was quite ready to meet with them (or it was time to go), they would go through a Fry Phrase Powerpoint set. It only took them a couple minutes and it was an easy go-to for them. If they went through the entire thing and felt they read it fluently, they’d call me over as we were switching and I’d listen to them go through the set. If they could read it fluently, they’d move on to the next one. I kept a recording sheet next to my computers so I always was able to quickly record their progress. However, you totally could just have these an available option for your kiddos to practice with on the computer or on iPads. With 600 slides, it gives students practice on a wide variety of phrases and helps build their automaticity as they find them while reading. I also included a recording sheet and a couple different certificates that you can use to reward students’ success! You can see a bit more about this set by clicking the pictures and heading to the item in my TpT store. The pictures and the preview give you a quick glimpse! Another way I plan on having students independently work on building their fluency is by using these phrasing cards. Students take a card, read the top line, then go to the next, and so on. It builds their fluency because their able to see and feel natural phrasing. It also helps them by doing repeated readings. You can click the picture below to head to it in my TpT store. Click the PREVIEW button to download this page for free! At this point, I plan on printing a couple sets, putting them in index card boxes and having them as an option during Daily 5. That may change though. How do you have your students work on their fluency independently? No, I hadn't seen that before. Thanks for sharing! Thanks for the website suggestions!